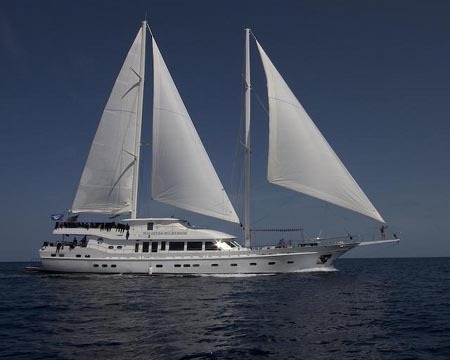 Contact us today as these charters will sell out fast with this fin-tastic discount...! The big attraction, however, are the schools of fish that patrol the reefs in colorful packs: Humpback and Black and White Snappers, Trevally Jacks, Barracuda, Batfish, Unicornfish, Yellowback Fusiliers and Harlequin Sweetlips almost comical in design. The reef's larger inhabitants, including sharks, rays and occasionally even Whale Sharks, are often seen cruising in the blue. 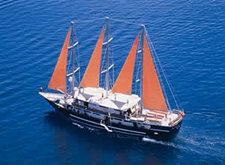 We are offering a 7 night special expedition deal on the Tui Tai that has been reduced 40% for travel July thru December 15, 2013. This package includes R/T airfare from LAX, airport transfers, Expedition cabin accommodations, all meals, adventure activities (trekking, village visits, mountain biking, kayaking, and snorkeling). 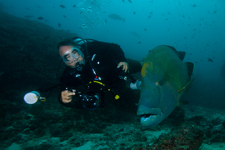 Scuba diving can be added to the package (17 dives and ALL gear included). Adventurer package is $3,109 ppdo. Scuba diver package is $4,183 ppdo. 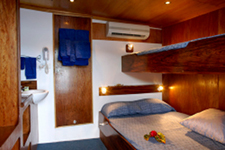 After five nights on the Tui Tai, you will agree the services are second-to-none. A gourmet menu prepared fresh daily in our outdoor kitchen, mealtime excursions to dine on deserted beaches or in lush rainforests, full bar, housekeeping and laundry, professional spa treatments and yoga sessions under the clear blue South Pacific skies– it’s all here for your enjoyment. 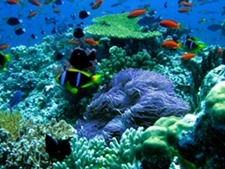 And scuba dive some of the best reefs in Polynesia....! Roam renowned Rainbow Reef dive sites within the Somosomo Straits, including "The Great White Wall," and other sites comprising what Jean-Michel Cousteau once dubbed "the soft–coral capital of the world"
Marvel at coral gardens at The Farm and Nakawa Point, features in Lonely Planet as "one of the world’s greatest snorkel sites"
Explore the sites we call "little Rainbow Reef" near Rabi Island, where you’ll likely share the water with a dozen or so nine–foot manta rays. Hiking, kayaking, swimming, scuba diving, snorkeling, stand-up paddle boarding, visiting remote villages and simply sailing the clear blue waters of the South Pacific–Tui Tai offers an adventure for everyone. Best of all, you just need to show up. Our expertly–maintained gear is the best money can buy, and our dive instructors, botanical experts and team of local guides will provide you a trip you’ll never forget. Contact us today for availability and additional information about this fin-tastic cruise...!